I promised I would try and do a series on activist artists, and here I am keeping that promise. The first artist I profiled was Lynn Schirmer (https://ritualabuse.wordpress.com/2013/09/20/lynn-schirmer-activist-artist/) Now I am gong to introduce you to Kim Noble. Kim is an fifty-three year old English woman who spent her teens and young adult life in and out of psychiatric hospitals. Like many, she collected a variety of diagnoses until her DID was recognized in 1995. She has, and always has had, strong amnestic barriers between her personalities. There is no co-consciousness, no internal communication, and only a few personalities reluctantly concede they share the body with others. She has two ways of finding out about her other personalities: what her therapist tells her, and what her artworks shows her. She can’t imagine it otherwise; co-consciousness, to her, would be a total invasion of privacy, as if somebody was constantly spying on her. And having to listen to alters talking inside! No thanks. The person called Kim Noble in the art world is really Patricia, the third alter to manage daily life. (People who have known her a long time call her Patricia, but she introduces herself now as Kim.) Patricia is extremely capable; she fought social services to be allowed to raise her daughter — and won. *1 She came though a horrible attack when acid was thrown in her face and her attacker tried to set her on fire while she was asleep in bed. Indomitable is the word that comes to my mind. 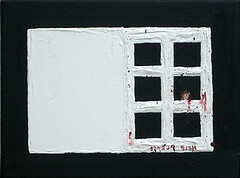 In the course of her therapy, she worked for a few months in 2004 with an support worker who was studying art therapy. The creative floodgates opened, and first one, then another personality took to painting like ducks to water. Each personality has a different style, ranging from abstract art to realism. 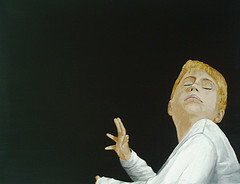 Some depict the abuse they suffered as children, others do not paint of the abuse; and their paintings therefore show a wide range of content. And go public she did. As of today, she has shown in over 30 galleries in England, the United States, Spain, and the Netherlands and has participated in 35 group exhibitions with other artists. And she is in a gallery in Second Life! Think of the number of people who have learned about DID from just one show, then multiply it by 65. Several of her personalities allow themselves to be interviewed. Patricia even had the courage to appear on Oprah!!!!! *2 And think of the number of people who saw her there!!!!!! Here is “Green Desert” by Patricia, who now is responsible for everyday life — raising her daughter, paying the bills, going to therapy. She uses serene colors and is grounded in nature. I find her work exquisite and could easily live happily with any of her paintings on my wall. These two paintings are by Abi, and are the most representational. To my eyes, the placement of the figures and the spaciousness evoke loneliness but also a sense of depth and meaning beyond the literal. I love the synergy between the color palette and the emotional content. These two are by Ria Pratt, and are scenes of the abuse she endured. She often uses backwards writing and shows sketchy figures floating above the children being tortured, reminding me of out of body experiences. Her colors are vivid and the compositions striking. 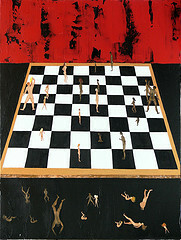 Judy, who is fifteen, painted “Game of Life.” It is clearly about abuse, but is less literal, more symbolic, than Ria Pratt’s work. This box is by Key. 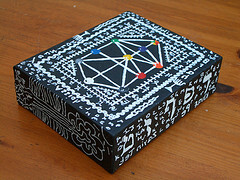 You can’t see all the words and symbols, but you may recognize the Kabala in the center. Key’s work haunts me because I resonate with what is being said, or perhaps not said. Kim has written her autobiography, “All of Me.” There is a preview of it on Google Books and also on Amazon. She’s just finished a foreword for a book for survivors, “Becoming Yourself: Overcoming Mind Control,” which will be published next year and is by the Canadian psychologist/author Alison Miller. Kim is looking forward to writing a more detailed book in the near future. But art is still and always her first love. In March of 2014 there will be an exhibition at the Tavistock Clinic in London. This is a big step toward exhibiting in main-stream venues and moving away from having her work classified as Outsider Art. 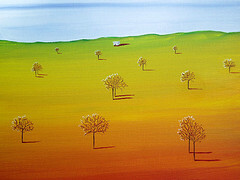 She hopes, in the near future, to be able to support herself and her daughter through the sale of her paintings. Now, I want to make something abundantly clear. Nobody expects you (or me) to achieve half of what Kim has. Remember that we each have our own abilities and talents and that we use them as best we can to fight against ritual abuse. There is no point in comparing yourself to others: it only leads to putting yourself down and narrowing your options. Telling just one person is activism, working hard on yourself is activism, fighting to get free or stay free is the absolutely most powerful of all forms of activism. Do what you can, and rejoice in your accomplishments, for every day you disobey what you were taught in the cult is a triumph. They sound like great people, but living without any kind of internal communication or coconsciousness sounds like a nightmare! There are times when it’s nice to have a quiet moment, and then there are other times when a kiss from my husband brightens a gloomy day…and times when it’s vital to hear inside our head, “Don’t go near that person ever again, they may act friendly on the surface but they dress like a Monarch handler and just dropped a cluster-bomb of come-in-for-reprogramming passwords!” I don’t think we’d be able to physically survive in permanent isolation from each other, let alone produce art. It’s really impressive that they have made such a good life for themselves. It’s absolutely amazing how many different solutions there are to the problem of living as many — as many solutions as there are survivors, I would imagine. I titally admire Kim but that wouldn’t be my path. excellent article, Jean. thank you for introducing me to Patricia/Kim and her art. Your statement about advocating in our own individual ways is powerful. We are all advocates if we are alive and saying “NO” to the perpetrators of mind control. We must show and tell. We can have own life only if we live it. One note, that thing is called the kabalistic tree of life. Actually, as the cult is dualistic, there are two such trees – of life and of death.